Most of our users know that we allow you to lock individual content blocks within a template or content library item from editing by a document creator. But we received several requests from those who wanted to take this a step further by providing the same functionality within the pricing table. Hooray! 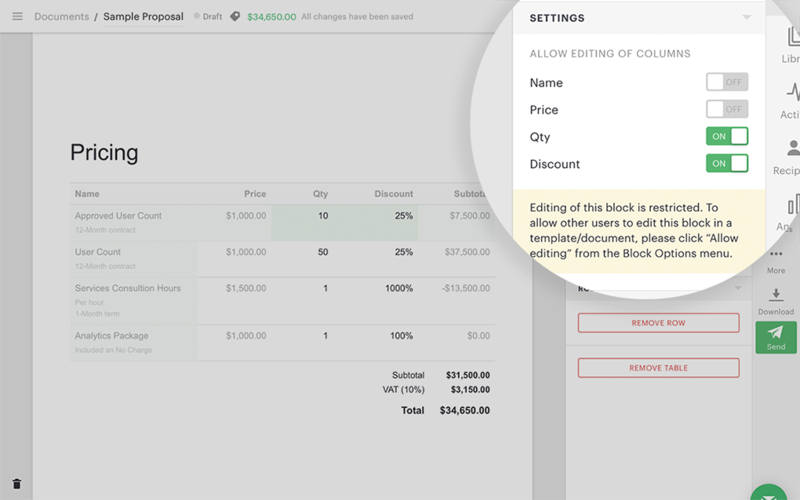 You can now lock/unlock editable columns of the pricing table! The most common use case is only to allow your users to edit the quantity column to prevent further discounting. This feature is available for Enterprise plans only, mainly due to Addon restrictions. When this feature is enabled, a team member can change only the editable columns within the pricing table, and they can only add items from the catalog and remove rows if the selected column allows for edits. 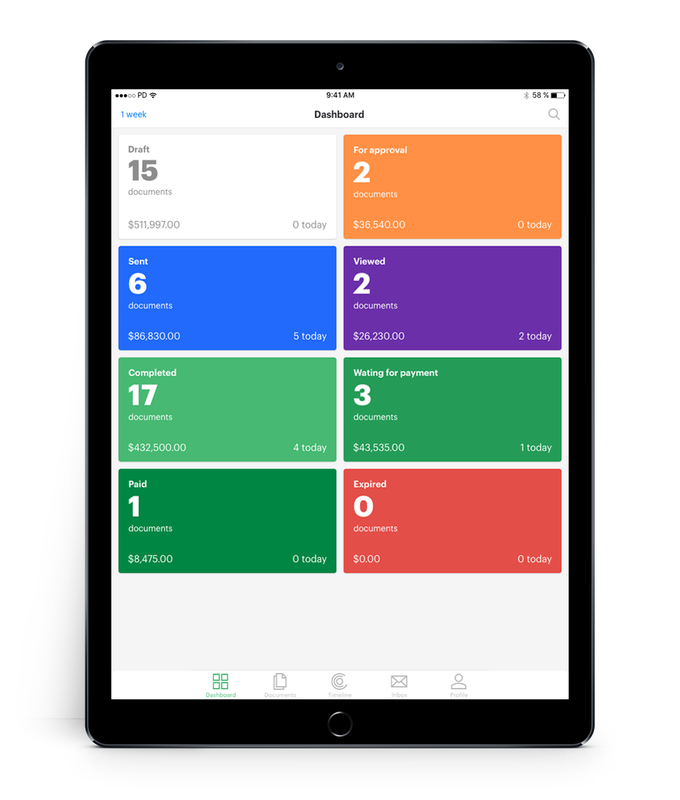 Our pricing tables are dynamic and offer our users a multitude of options so they can put their best foot forward and provide their clients with options that are best fit for their business. 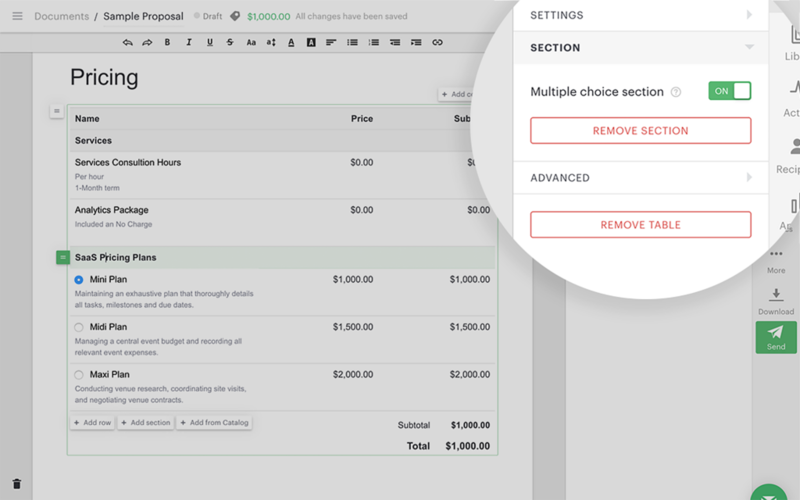 In addition to making pricing optional, you can now provide recipients with a multiple choice pricing option. This feature allows your recipient to choose one pricing that is the perfect fit. The feature also limits your document recipient to select one option from a group of options to eliminate confusion. This Multiple choice pricing option is a foolproof way to help aid your recipient if they are still stuck or indecisive. It is an excellent fit for sales reps whose prospect hasn’t quite decided which pricing package they want. 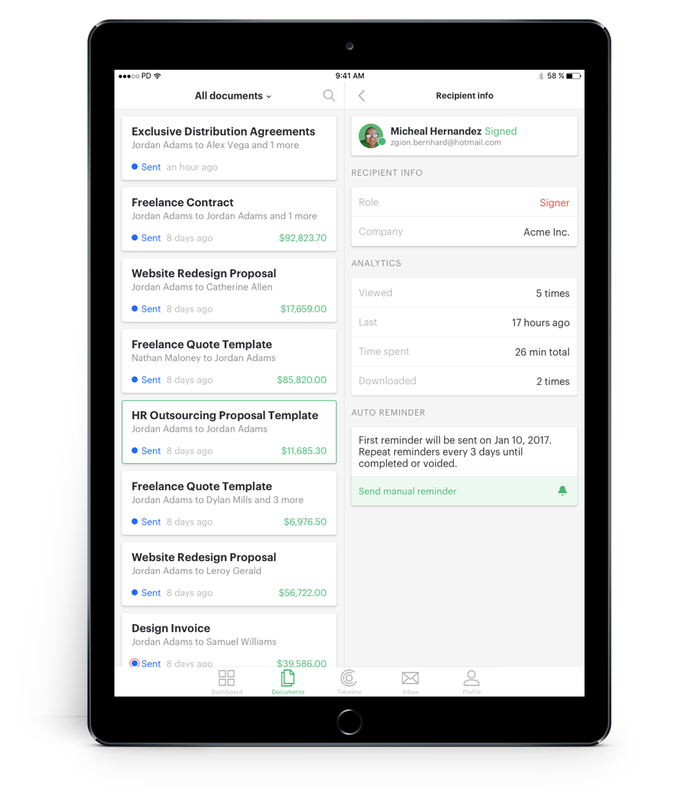 Now a rep can provide options so that the prospect can choose what is best suited for them. This feature is available for all plans and is a feature toggle under section settings in the pricing table. More often than not, we’ve heard from customers who needed to attach additional documents to their quote, proposal, or contract but didn’t want to add them inside the body of their PandaDoc document automatically. 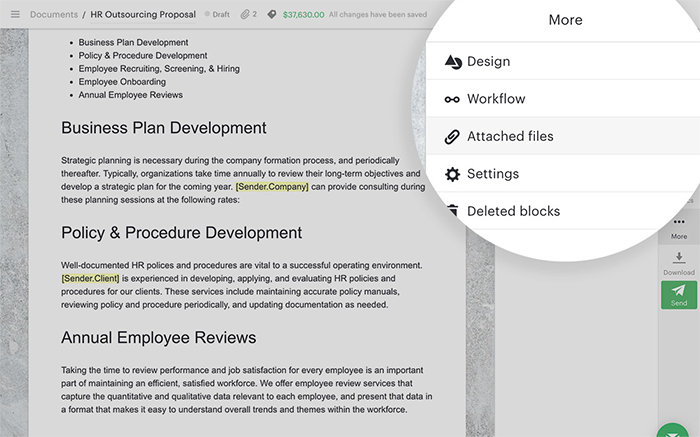 Now we’re allowing you to attach downloadable files to your documents! The Attached Files feature will allow you to add a file of any type (PDF, Word, etc.) to your document. The file size can be a max of 50MBs, and you can attach up to 10 different files. This feature is great for those who are looking to add supplemental information, larger file types, Excel spreadsheets, or any other content you’d like to attach but not include in your document. The Attached Files feature will be available for all plans, and you can find it in our Add-on Store. By default this feature will be turned off. The document owner, manager or admin who has access to the document will be the one who can add, remove, and download the attached files. Last September, we made extensive updates to the PandaDoc mobile app to improve the overall functionality for our users who are on the go. We are happy to announce that our mobile app now works on an iPad or Android tablet too! 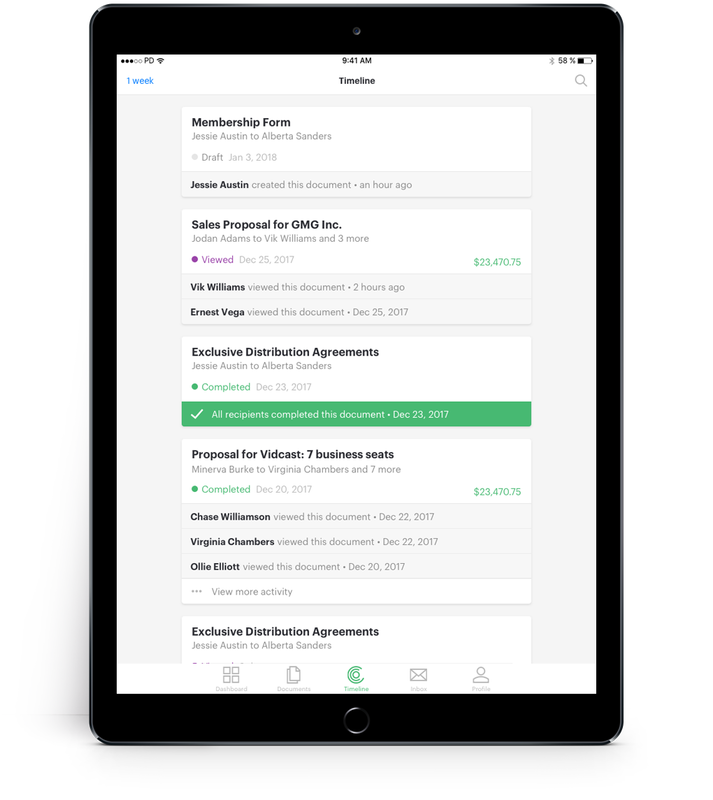 Take PandaDoc wherever you are and use the mobile app to view, approve, eSign and track documents to keep your business moving forward. To download the app, head to the App Store or Google Play store. Well, that’s it for the first month of 2018! Give these new features a try by logging in to your PandaDoc account or starting a free 14-day trial.